A legend of the 1930s revisited. 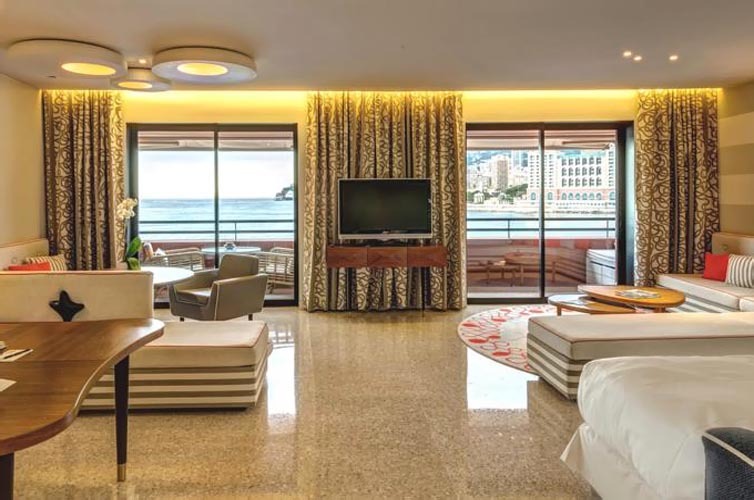 The Monte-Carlo Beach has been entirely redesigned to offer a decidedly modern experience, blending the atmosphere of the Jazz Age on the Riviera with the intimacy of a luxury residence, and the most contemporary interior decor with the soul of a timeless luxury hotel. The Monte-Carlo Beach, a chic and timeless hotel built in the 1930s, has always been the epitome of glamour and "dolce vita". This palace, which has received celebrities from far and wide, has been renovated by architect designer India Mahdavi, and restored to all its former glory. Sea all around, and with an original terracotta façade and frescoes inspired by Matisse and Cocteau make it the perfect setting for an exquisite break. 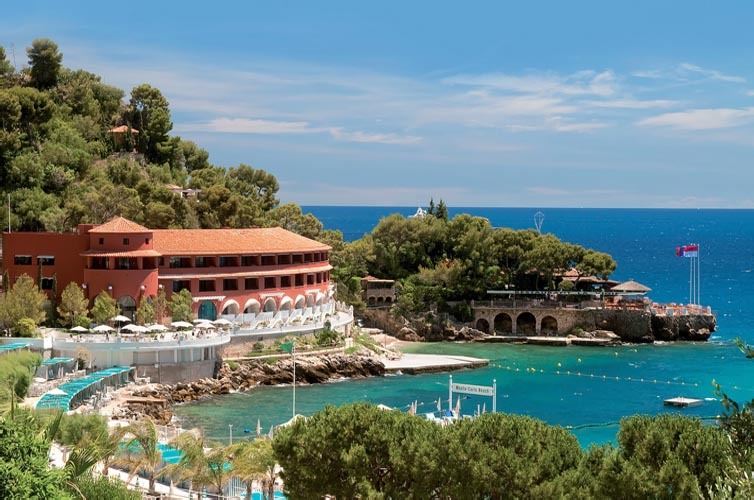 Located in a site of outstanding natural beauty, in the shelter of a pine forest, the Monte-Carlo Beach offers a “Cabanas” service, an Olympic pool, a La Prairie spa and a gourmet restaurant, certified as 100% organic by Ecocert. Push open the doors to the Monte-Carlo Beach and treat yourself to an exclusive stay alongside a team dedicated to providing you with personalized service. Excellence and indulgence mix with peace, tranquility and a cozy feel… Lounge by the edge of its Olympic seawater mirror pool which is heated to 24°C and equipped with an ozone filtration system, recline on its private beach dotted with adorable striped canvas shelters, bungalows and sun lounges, or relax in one of the little shacks scattered around in the shade of the Aleppo pines. While your children play at the Marmorata Club, pamper yourself with a moment of pure pleasure at the Monte-Carlo Beach spa, which uses 100 % organic La Prairie and Ymalia products. Remember what it feels like to indulge in the simple pleasure of doing nothing at all. The hotel’s restaurant is called the Elsa in tribute to the woman who so profoundly influenced the history of the Monte-Carlo Beach. Driven forward by the talent and creativity of Michelin-starred head chef Paolo Sari, the Elsa is the Côte d’Azur’s first 100% organic Michelin-starred restaurant, and it has Ecocert certification. Its menu features authentic, seasonal dishesmade using locally sourced ingredients. Chef Sari makes sure to keep things varied and the establishment is also happy to cater for special dietary requirements. At La Pizzeria, tuck into delicious wood-fired pizza as you contemplate the ocean. At La Vigie, savor a range of exquisite fresh seafood. You may prefer to head over to Le Deck to soak in its trendy feel and Mediterranean brasserie style. Today, the 100% organic philosophy initiated by head chef Sari in Elsa’s kitchen has become a way of life for the entire Monte-Carlo Beach, from its foundations to its rooftops. 40 rooms including 5 junior suites, 7 suites and 2 double suites. Sea Lounge Monte-Carlo exclusively open for the three days of the Formula One Grand Prix in May. A beautiful 30 m² room with sea view and charming loggia offers the horizon as a spectacle. The terrace is an exclusive feature on the ground floor, with stairs leading down to the La Vigie promenade. - Size: 323 sq. ft. Imagine the sea in your room: a porthole between the bedroom and bathroom is a source of light and depth, while the openwork designer doors cast interesting shadows. - Location: 1st or 2nd floor. Exclusive design, a loft spirit and splendid views – three ingredients behind a magical alchemy at the Monte-Carlo Beach. - Size: 538 sq. ft.
- Bathroom with bath, shower cubicle, two washbasins and TV screen embedded in the mirror. 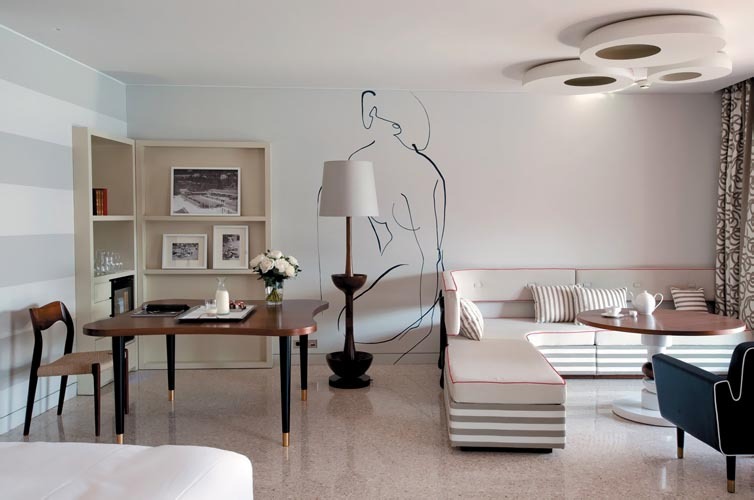 Timeless chic awaits you in this suite which recalls the past: prepare for a rendezvous with Riviera elegance. The glamour of the twenties is subtly expressed here. - Size: 646 sq. ft.
- Shower room with washbasin and toilet and a bathroom with bath, two washbasins, toilet and TV screen embedded in the mirror. - Location: ground floor, 1st and 2nd floor. - View of the sea and pine forest. Prepare for an imaginary cruise; be lulled by the sound of waves recalling a Riva going by. - The Loft Suite offers an open space incorporating the sleeping area and the lounge, a dressing room, a bathroom with bath, two washbasins, separate toilet and a TV screen embedded in the bathroom mirror. - Exclusive feature: it has a superb hammam in the very spacious shower cubicle. - Size: 753 sq. ft. Exceptional, exclusive and unique are the only words we can find to describe this beautiful suite. Ideal for a honeymoon or romantic break. - Size: 1077 sq. ft.
- Bar in the lounge with attractive reed screen. - Location: 1st and 2nd floor. - View of the sea, beach and pool. In a charming seaside location between Cap-Martin and Monaco, at a rendezvous with wellbeing and a Riviera lifestyle, this magnificent villa offers one of our most engaging suites. - Size: 1023 sq. ft.
- Dressing room and changing cubicle. - View of the pool. "Let the sun shine, let the sun shine in…" here the sun is everywhere. You can even enjoy it on a beautiful private terrace. - Size: 2153 sq. ft., including roof-terrace solarium of 1077 sq. ft. with jacuzzi. - A lounge and library area – dining room. - A loggia overlooking the Olympic-size pool. - Location: 2nd floor and roof-terrace on the roof. - Panoramic view of the pool. Aboard a platform boat, take off and fly over one of the Côte d’Azur’s most breathtaking sites: Monaco and its buildings followed by Cap Martin and its villas against an Alpine backdrop. Cruising or top speed? Alone or with a partner? It’s all up to you! It looks unusual and is well designed for effective results: with its revolutionary shape and dimensions, it quickly becomes vertical, can jump from wave to wave, jump out of the water and make extraordinary leaps. Enjoyed at any age and in complete safety, the Flyfish is a cool family activity and fun for sporty types. Experience the phenomenon of the centrifugal force with your friends, jam-packed with twists, twirls and thrills! Do you feel like a getaway to discover the Mediterranean or the coasts of the French Riviera? Hire our boat “Still Niet” every morning between 9.00 and 12.00. Capacity for 2 to 6 people. Led by qualified instructors, this turbine-based propulsion system placed under your feet will make you fly above the water! A green paradise surrounded by blue at 900 metres above sea level, this 18-hole golf course nestled between the French and Italian Riviera offers guarantees pure enjoyment and total relaxation. The Monte-Carlo Golf Club designed by Willie Park, Jr. opened in 1911. It offers an 18-hole golf course in an idyllic setting between the sea and the mountains! The golf course, located in La Turbie (in the heights of Nice), has a rolling terrain that requires extreme precision. Discover an elegant club in a warm and friendly ambience! It is also possible to hire equipment such as caddies or golf buggies. Thank you for choosing to book Monte-Carlo Beach.! Due to limited availability you are encouraged to contact the reservations department to enjoy our personalized service, by phone on (33) 493 286 666. Please fill this form for individuals or for groups and you shall receive an answer written by a live person at Monte-Carlo Beach. This is the only way you can know exactly what room types are available for the dates you want, and the best possible rate, because you are dealing directly with the hotel. The ultra-modern Monaco – Monte-Carlo station receives several international trains every day.